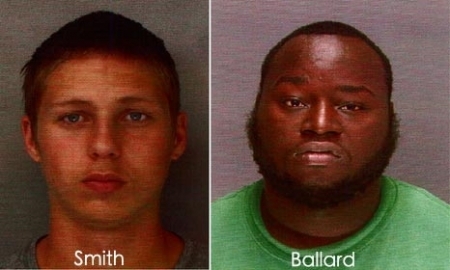 Two men have been arrested for the deaths of an elderly couple found murdered Thursday morning in the Strawberry Mansion section of Philadelphia. Investigators say that 26-year-old Terry Ballard and 19-year-old Justen Smith have confessed to suffocating the couple. Ballard and Smith had been hired to do odd jobs at the home of 79-year-old Rufus Perry and 66-year-old Gladys Perry. Ballard's grandmother was friends with the couple. Gladys caught the pair going through an envelope believed to contain money at which point they attacked. They made off with $120 and a gold chain. They are now facing two counts each of murder, burglary, robbery, and criminal conspiracy. The Philadelphia Phillies are testing a pilot program out at the right field gates through the rest of the season with the addition of metal detectors. Beginning next year all MLB ballparks will be required to have the security features installed. For now, only the one gate will be scanning fans beyond the normal pat downs. Of course it's all to keep us safer inside, stopping weapons from entering the facility, but it'll catch any booze smugglers with their flasks as well. There is no need to take off your shoes or belts, just take your phones and keys out of your pockets. You can just avoid that entrance for now, but next year every gate will have them. Clear skies, temperatures around 80 this evening in Center City.